How to insert a new, expensive and niche technology in Latin America's smallest market, whilst targeting three completely different audiences simultaneously. Fabrix is the first 3D printing concept store in South America, founded in 2014. It offers a wide range of services that go from 3D printing, scanning, model prototyping and software education to the both physical and online sale of 3D printers and supplies. The client carries out since 2003 a company called Danston S.A. which is in the business of importing supplies and accessories for inkjet and laser printing. The idea of importing 3D printers is born from the client in 2014, after visiting a printing trade show in China and forseeing its potential in the Uruguayan market. By identifying the trend that would manifest in South America and the rest of the world about a year later, the client commissioned Suiza de America to create a Danston sub-brand, that would include the 3D printing products as a new category within the company. Our role as creators of the brand would consist of carrying out a naming process, creating an online and offline visual identity system and defining a communications and marketing strategy for the correct implementation of the new brand in the market. Notion of what existed in the 3D printing world. Enough time to develop the brand holistically. True interest from the client to be market leader. Local market in quasi-virgin state. Worldwide "hype" about 3D printing. Clear business plan not developed. No experience selling to end consumer or target audience. Enough know-how of 3D printing not yet available. 3D tech sounds daunting to the target audience. Product price point too high for local market. We concluded that it was necessary to separate Danston S.A. from the new venture since it was about a different technology and aimed at a different audience. Regarding the international situation of 3D printing, we verified that there was indeed a trend in which the engagement of the mass audience in the creation of consumer products was exponentially growing. Activities related to the sector didn't depend on hardware or software, but on people, their culture and their individual needs. Depending on the geographical location and its market habits, the companies (franchises in some cases) offered from online services to manufacturing in situ, classes or workshops and both online and offline communities with a strong DIY spirit. In all cases, all the activities available were aimed at 'materialising ideas' in a highly social way. As for the local situation, we found that the new venture had a unique opportunity to be pioneer in the Latin American market and the main drivers of this technology if it offered an integrated proposal. At that time, there were no suppliers of an all-inclusive 3D printing experience, but small companies in experimental phase. Since the venture did not initially have a defined business plan, a large part of the brand's development was to help the client create it. We concluded that a unique visual style was needed in order to cater to the three defined target audiences: kids in school years, design/architecture academia and adult tech/DIY aficionados. Social media, direct pitches to academic institutions and an online store were defined as the key communication channels . We also determined the need to create a series of partnerships with other businesses and/or sponsor events relevant to the target audience to be able to access the market quickly. The name Fabrix, a neologism, is chosen, which represents the way in which 3D printing allows to obtain products at home that used to be mass produced in a factory. It also recalls the action of making, sounds active and it can be associated with manual work. 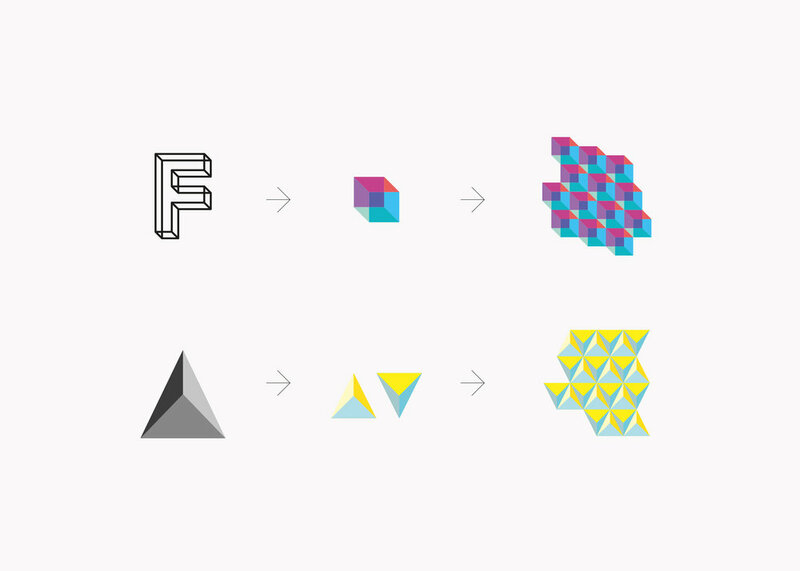 As for the logotype, the Fabrix wordmark is based on the multiplicity of processes and results that can be obtained with 3D printing. Each character shows different ways of portraying three-dimensionality on a two-dimensional surface. This mimics the process our eyes and brain have to carry out so we can comprehend depth. To focus the attention on the morphological, the logo is presented in a grayscale palette. The colour versatility that can be obtained with 3D printing is represented by ample fields of colour blocking and a series of geometrical multicoloured patterns. Each pattern is based on the shape of an individual letter of the brand name. Colours are not selected arbitrarily, but "eyedropped" from the imagery of the brands that Fabrix imports products from. This allows the Fabrix brand to live seamlessly among a huge selection of logos and graphics, while making everything feel part of the same universe. The brand was successfully introduced in the local market, becoming a benchmark in the sector, both for architecture, engineering, design students and the mass audience (with custom printing services) as well as at the corporate level (with the sale of printers and supplies for schools and universities, and also for the construction and product development industries). Strategic partnerships proved to be very useful and fruitful both for the economic repercussions by having access to new potential customers and for the positive media exposure received. An example was the linking with the National Union of the Blind (UNCU), allowing students to experiment via 3D printed maps, the geography and topography of the world. This responds to one of the biggest failures in education in Uruguay for people with visual impairment: the study of science at elementary and secondary level. Another example was the partnership with the Montevideo shopping mall and Disney/Pixar for the premiere of the movie "Planes". Fabrix gave children 3D-printed airplanes to decorate while simultaneously learning. An alliance with the IBEC educational centre was achieved to provide courses in 3D design and prototyping, again becoming a pioneer in the market by offering professional training in the field. These actions, as well as effective campaigns in social media, has resulted in 14,200 followers and a review of 4.8 on Facebook (data from 2016).